16 race promotors in the F1 Promotors Association. Interesting development. The need to go public with this may be telling? Edited by Ben1445, 29 January 2019 - 09:22. The winter of discontent is in full flow, promoters unhappy with Liberty, teams not buying into their vision, come on Bernie it cant be long before they come calling begging you to take it off their hands. Perhaps it would be better to split this into a new topic? As we enter a new season of the sport that we have promoted for many decades, the Promoters seek a more collaborative approach to the development of the championship and the opportunity to offer their experience and expertise in a spirit of partnership with Formula 1 and the FIA." Correct me if I'm wrong, but wasn't the Sky live race exclusivity deal (in the UK) done before Liberty came in? I have vague recollections of that being one of the last things Bernie did. So, why are they mentioning that now, rather than a few years ago? Has any other country lost free-to-air live races since that Sky deal was announced? I think the TV deal is a false flag here. It was a deal brokered by Bernie and they were all too chicken-s*** to say anything about it then, so they are just chucking it on top of the Miami issue because they know it'll garner public support from 'us lot'. My main worry is that they'll continue to take the sport away from it's traditional races. The main reason I can see for the circuit promoters getting annoyed is that Liberty has been offering favourable deals to new tracks while still trying to play hardball with the old tracks. Not really surprised as it's just a recipe for disaster unless you offer all promoters similar terms. On top of that Liberty basically said to Silverstone through the media that they'll take the race somewhere else such as London if they don't like the deal on the table. Edited by F1 Mike, 29 January 2019 - 12:50. It’s been rumbling for a while. So many promoters can’t make the numbers work anymore, and the public money that kept some western events going is rapidly starting to dry up. There is a real question over how much any big event is actually worth to the local area - after decades of sellers inflating the numbers - and whether forking over millions to the likes of Bernie is the best use of public funds. With contracts running out and Liberty willing to come to more generous terms with new locations, I suspect many circuits will hold out and refuse to extend without significant savings. The old motivation of needing to host a Grand Prix to keep the place going throughout the year doesn’t work now they just can’t afford it anymore. I’ve harped on for ages that the goal of moving towards 25 races was unrealistic, because of how difficult it would be to keep the existing races. The balance of power seems to be shifting away from FOM. With contracts running out and Liberty willing to come to more generous terms with new locations, I suspect many circuits will hold out and refuse to extend without significant savings. They may also (in part) be forced in to this situation by the people propping up the events. Even if the folks approving tens of millions in subsidies for these events are not the most fiscally responsible people around, even they can figure out that other people are paying much less for the same circus, and they'll make it clear to the organiser/promoter that they need to lower the costs. 'If they can, why can't you!? ', and such. I think that is the gist of their complaint... favorable terms for new races whilst they struggle under previous deals agreed with Ecclestone. Their broadcasting gripe is an issue which is a legacy of Ecclestone, yet Liberty have done a far better job with online content, which was largely ignored when Ecclestone owned the sport. Is it so that Formula One Group gets revenue not only from hosting fees but also from trackside adverts? And as a result we've seen most circuits have pretty much same adverts. It's nothing new to offer new promoters better terms in the short term, and then when they have spent millions on facilities hit them harder. They can then either pay up or be left explaining why they have invested millions in a huge white elephant that doesn't have a grand prix. Bernie did it too. Agreed. Last year Silverstone and Mexico were the top two best attended events, if they can't make money then something is rotten and the funding model needs to change immediately before those fans who have supported F1 lose their event so that Liberty can get bigger hosting fees from new venues. It's all well and good for Liberty to talk about the teams needing to have budget caps what about looking at themselves. I would recommend that hosting fees be capped at around 30 to 35% of venue ticket income. If Liberty don't agree (and they won't) then perhaps it is simply time for the promoters and any sympathetic teams to give the FIA and Liberty the flick and just go their own way. 16 promoters are enough to host a series particularly seeing the circuits they represent. So if this is 16 Grands Prix, and Russia are not part of the 16, then who are the other three ? Bahrain, Abu Dhabi and Azerbaijan ? 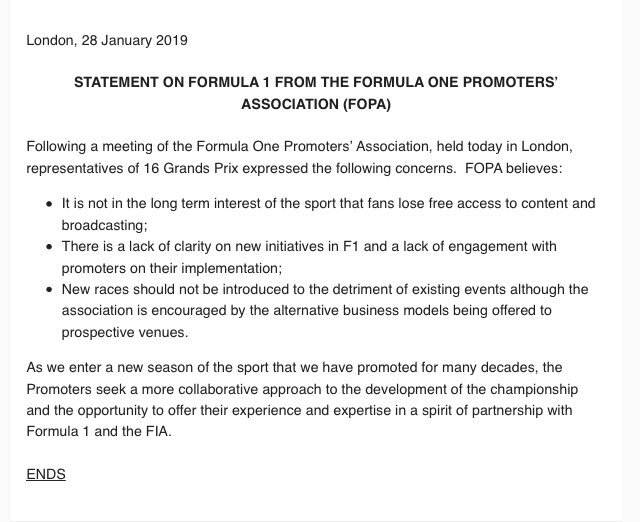 The race promoters outside FOPA and not therefore implied to be related to the original statement are the Chinese, Bahrain, Abu Dhabi, Russian and Japanese Grands Prix. Getting a little off topic but given Bahrain's human rights record and their current stance over recognized refugee Hakeem al-Araibi the Grand Prix racing community should have nothing to do with Bahrain anyway. Edited by RacingGreen, 29 January 2019 - 21:22. It just feels to me like Silverstone are in crisis and they are trying to build up support. The have activated their break clause and, I suspect, they were hoping that they would have been offered something by now. My reading of this is that they are the ones really worried because they do not want to stop hosting the British GP and may have to unilaterally withdraw their withdrawal, as it were. I agree that the concerns are legitimate, but I do think this smacks of Silverstone getting very twitchy. The "moving to pay-TV" sounds to me aimed primarily at the situation in the UK. They are doing a pretty good job of building up support if they have 15 other circuits with them. Of course they don't want to lose the British GP but not at the cost of bankrupting the track. They are doing jsut the t right thing and facing Liberty down over its shoddy antics about offering Miami a free race. The interesting thing seems to be that Monaco must be in the 16, and they don;t pay a cent. Maybe they feel undervalued? Exactly. And FOM get the TV revenues. Other forms of racing pay a fee to hire the circuit. In F1, the circuit pays the "owner" of something that was not "owned" by anyone for its first eighty years. Silverstone's owners used to make money from the Grand Prix, but they're a non-profit organisation so used the surplus to subsidise club racing. Now, if I understand correctly, club racing is subsidising the Grand Prix. If Liberty don't agree (and they won't) then perhaps it is simply time for the promoters and any sympathetic teams to give the FIA and Liberty the flick and just go their own way. 16 promoters are enough to host a series particularly seeing the circuits they represent. Who will fund this breakaway series? There is around US$ 1 billion in revenue distributed to the teams under the current model. The team spending levels are predicated on current revenue to sustain the current business model. Where's that billion coming from? What about the operational and promotional capability to run and operate the series? You're going to need not only TV production but TV distribution as well. Who's paying for that? That's going to be tens of millions a year in overhead. They wouldn't be using FIA regs so they'll have to write and administer those. How's that going to work? If there are 16 tracks each will have to front about US$100 mil just to get the thing off the ground at the current levels. No problem because if they are having problems paying a US$20-25 mil sanctioning fee now with a full house and proven product it'll be easy for them to quadruple that amount with a new product run by people that haven't done it on this scale. Funding a series doesnt have to be astronomically expensive or impossible. Look at A1GP. Its first season was privately funded by Sheikh Maktoum Maktoum Maktoum Hasher Maktoum Maktoum Maktoum Al Maktoum Maktoum Maktoum.. Maktoum. While those are valid questions, they're not things that will make it impossible to run a series. New series spring up all the time. Also, they could very well use the current rules package as a base for whatever they might do. Superleague Formula would be a terrible name, as that brings with it not only the shadow of an unsuccessful series of the past, but it's a football based name anyway. For your information according to Forbes/ Formula Money the cost of hosting a GP on a street circuit with temporary rented infrastructure is around $57m a year plus the approx $40m annual fees, ie $1billion per circuit over the 10 years of a contract. Of course a venue like Silverstone who are not spending $20M on temporary stands and fencing would of course have a slightly lower overhead although they will still have loan interest on any borrowing they have made to buy and build their infrastructure. The point being that if they ran the series themselves there would not have to pay the $40m a year and would also have the track-side sponsorship income to throw into the pot and any TV deals they could do. There would be more than enough to run a series without teams going broke if CVC or Libery Media wasn't bleeding the sport dry. As for the name as Mohican says there is nothing wrong with the term Grand Prix. Astronomical numbers. Certainly if you look at it the IndyCar way. For a team with built-in infrastructure, it costs about $1 million to field a competitive entry, according to Chip Ganassi. A new entry from scratch, puts the price tag at $2 million or more. That is for a series that is settled, acknowledged and has its finances worked out already. Let's say we multiply that amount in tenfold. Then you are still nowhere near anything around 100 million to run your team. Agreed. Last year Silverstone and Mexico were the top two best attended events, if they can't make money then something is rotten and the funding model needs to change immediately before those fans who have supported F1 lose their event so that Liberty can get bigger hosting fees from new venues. Races with 350K crowds can't make a profit, fans being charged 60% more to attend a race or $250 a season to watch on TV behind the paywall, teams running at the back spending north of $100m just to circulate, teams spending $400m + to win, manufacturers spending $1bn to develop an engine, title sponsorship no longer offering an attractive ROI... F1 has become way too expensive and it's the fans and circuits being asked to pay despite the quality of the content moving in the opposite direction. This is only going to get worse, costs to watch are going to go up, they're going to lose more and more fans, circuits are going to struggle, F1 revenue is going to fall... The only way to halt this inevitable slide is to massively reduce the costs of F1... but they won't. Edited by Beri, 30 January 2019 - 10:28. Of course, if there were a budget cap, those who lost their jobs could go to new teams that would be encouraged to enter F1 by a lower cost outlay. Or find their way into other motorsports. My point, the whining of Horner is just plain politics and based upon nothing than a castle in the sky. That's the kind of level I'd dream of in F1! Although perhaps a little too low. With Indy being spec, the teams don't need to spend so much to develop a car as they do in F1, but it does prove what can be done if there was genuine pressure to do so. I was thinking a bit of help while keeping the hosting fees as they are, but circuit can sell ~50% of the trackside adverts which would mean some other revenue for them from the race. Even if it were too low, the 100 million mark should never be passed. Gearboxes and suspensions could be spec and then 100 million for a team running 2 cars at the front of the field would not be that far fetched. Although its again another *mostly* spec series (I say mostly as the chassis and aero are but the powertrain are not) I think Formula E has the absolute right idea by putting a price cap on a customer powertrain and by forcing a manufacturer to sell to a team as long as they request so before a set date (about a year before the season starts). If you can only sell your pt for £250k but it cost you £10m that's really not sustainable. FE works in this way as the teams are so close in performance that no one pt seems to be dominating. This may change of course but I still think it's a good starting point. If all their contracts came up at the same time that would be true, but they don't have any joint power in negotiations. Agreed. Although that may prove to be a step too far for Formula One, I do think standardized parts of the car and limited expenses on certain areas will be the answer to these astronomical figures thrown at will. But besides the development of the car, it was common before 2000 to have two touringcar buses with a tent in between to be your hospitality unit. Why does that have to be so exorbitant these days? That's an easy 10 to who knows how much saved also. Or having 50 people sort out all parameters on the factory during a race. How about transportation costs that could be reduced if Liberty takes on chartering freight flights? Hardly surprising - Mexico wants to avoid criticising Liberty while negotiating a new contract as they don't have the factor of umpteen years' ontinued presence in F1 as the British and Italian GPs do, and I would imagine that the Russian promoters could pay almost any figure FOM quoted given the influence of Putin. Indeed, all the more if the regulations were opened-up to allow privateer teams on a basis somewhere between the privateers of the 1960s and Haas (chassis, engine and gearbox from suppliers and leasing wind tunnel sessions to allow aerodynamic development) which would give suspension and aerodynamics specislists an entry into F1. Combine that with a regulation that allows such teams to enter a single car if they want and another to provide a simple, non-hybrid customer engine at slightly over cost price from someone like Cosworth and we'd have secure 20+ car grids even if a manufacturer decides to leave. - All teams to be provided with two Transit vans and two open trailers. They may take as many people and as much equipment as they can get in the van.